Note. If Internet Explorer is not installed on your system, then the embedded WAPT Pro Recorder will not work; "Browser View" on the Response processing tab of request properties will not work either. Besides, you will not see help topics by clicking "Getting Started", "Profiles", "Scenario", "Distributed Test Run", "Results" and "Logs" items in the left pane. You should have administrative rights on your system to install WAPT Pro. The installation process takes a minute or so. All you need to do is to follow the instructions of the Wizard. WAPT Pro creates a comprehensive testing environment which consists of one or several workstations with the WAPT Pro Workplace component installed on each of them, and several load generation servers running WAPT Pro load agents. The workplace component can be installed on any workstation with the modest hardware configuration. Load agents should be installed on servers with a more powerful hardware configuration. 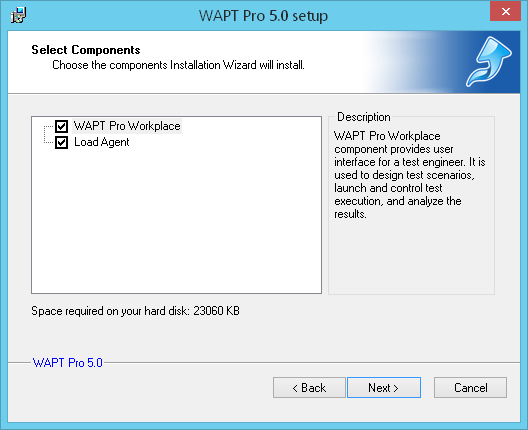 WAPT Pro Workplace: This component provides the user interface for test engineers. It is used to design test scenarios, launch and control test execution, and analyze the results. You should install WAPT Pro Workplace on the main machine where you will manage test runs. During tests the workplace component will automatically distribute the load among all specified agents and gather the results of test run. Load Agent: This component is used for emulation of user activity and test load generation. You should install it on one or several servers where tests will be performed. Agents are installed as Windows services. They receive all the necessary information for the test from WAPT Pro Workplace, create the specified load and return the results of test run. 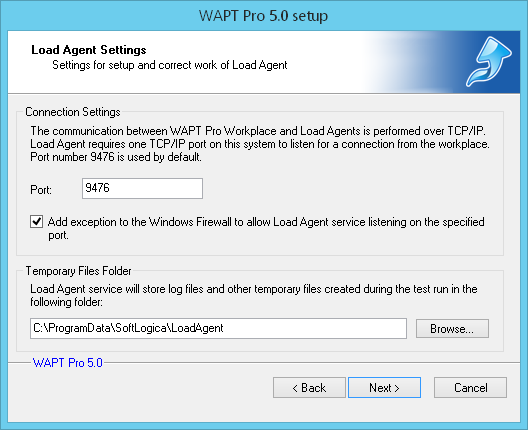 You can perform the full installation of the product (WAPT Pro Workplace + Load Agent), or install only WAPT Pro Workplace on your computer, or only Load Agent. Select both components on the screen above to perform the full installation of the product. Here you should specify the settings for setup and correct work of Load Agent. Port: The communication between agents and workplace component is performed over TCP/IP. Here you can change the default port that will be used by WAPT Pro Workplace to search for Load Agents in the Local Area Network and establish connections to them. Add exception to the Windows Firewall to allow Load Agent service listening on the specified port: This option adds a special exception to the Windows Firewall that allows the Load Agent service occupy any port and connect to any address. Temporary Files Folder: Here you can change the default location for Load Agent log files and other files required during test runs. This is the last page of the Installation Wizard. Launch Load Agent: Automatically launches the Load Agent service after setup. You can also start the service manually at any time using the Load Agent Manager. Load Agents are installed as Windows services, so you will not need to launch them each time you want to perform testing. 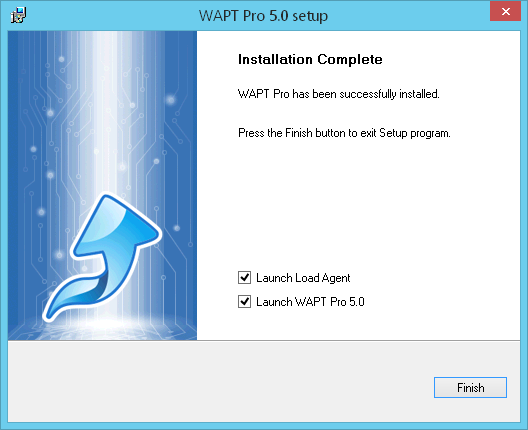 Launch WAPT Pro 5.0: Automatically runs WAPT Pro 5.0 after setup. Besides, you can open the program by clicking the WAPT Pro shortcut on your Desktop, Quick Launch, or Windows Start menu. Click Finish to complete the installation. There is no need to reboot. Note. We do not recommend installing WAPT Pro on a server you are testing, because test results can be skewed in this case due to the high load on the server. All steps of installation are the same as for the 32-bit version of WAPT Pro. long-duration tests that gather much statistic data. On the Windows Start menu, choose SoftLogica -> Uninstall WAPT Pro. The window of Uninstallation Wizard will appear, just follow Wizard instructions. You can also use the following way to perform the uninstall operation. On the Windows Start menu, select Control Panel, choose Programs and Features, find WAPT Pro/WAPT Pro (64-bit) in the list of currently installed programs and click the Uninstall button. Uninstallation removes all components added to your system during the installation (WAPT Pro Workplace and Load Agent). Load Agent service is stopped and removed.